On Checkout 51’s list this week (Sept 19-25, 2013) is LISTERINE® ULTRACLEAN™, Any LISTERINE® ULTRACLEAN™ variety. 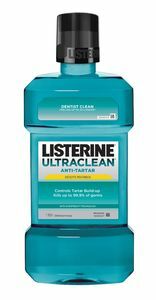 LISTERINE® ULTRACLEAN™ ANTI-CAVITY Mouthwash kills up to99.9% of germs to prevent gingivitis and reduce plaque. Plusthe added benefit of fluoride to prevent cavities and strengthentooth enamel. You will get $2.00 cash back rebate at Checkout 51. Here’s a pic of what it looks like. I found a couple prices of it at a few stores.